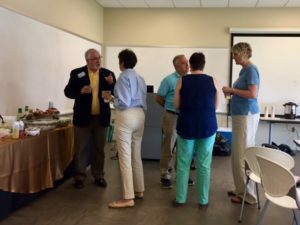 On Saturday, August 25, a baker’s dozen of enthusiastic Rotarians representing nine clubs from two districts gathered on the USC Lancaster campus for a Mini-Rotary Leadership Institute. They were eager to jump-start their RLI journey by completing Part I before the main “season” begins, so that they can complete the entire course as soon as possible. Rotarians Ken Dresser (North Mecklenburg, NC), Alvin Lewis (Matthews, NC), Georgia Oakes (Charlotte Providence, NC), and Bert Strange (Greenville, SC) facilitated the lively discussions. Thanks to the diligent efforts of Regina Maxfield and April Joplin of the host Rotary Club of Lancaster, the participants and faculty enjoyed a full day of learning more about Rotary and making new friendships. 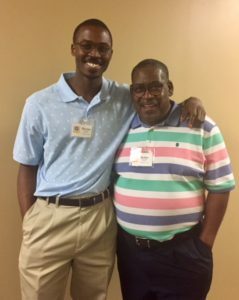 Perhaps the most special story of the day was the participation of Bobby Bailey and Keeonn Wilson, the father-son duo of Lancaster Rotarians. Bobby has been a Rotarian for almost 14 years. Keeonn joined the Lancaster Club on August 9. That’s right — he came to RLI with two weeks of Rotary experience under his belt. And guess which one insisted that they both come to the event. KEEONN. Now that is a young man who knows how to be a Rotarian! The folks in Lancaster have found a keeper!